Felix the Cat, the creation of Pat Sullivan and Otto Messmer, is perhaps one of the most famous and long-lived cartoon animals ever — pre-dating even Mickey Mouse. In the 1950′s, Joe Oriolo created a well-known series of cartoon shorts for Trans Lux Productions, which helped to bring Felix and his friends (and enemies!) to a new generation. Since the 1980′s, control of the “Felix Empire” has belonged to Joe’s son, Don Oriolo. Don has overseen the creation and distribution of Felix’s image on numerous products and in numerous media. Many of the images of Felix used for these were drawn and painted by Don himself. 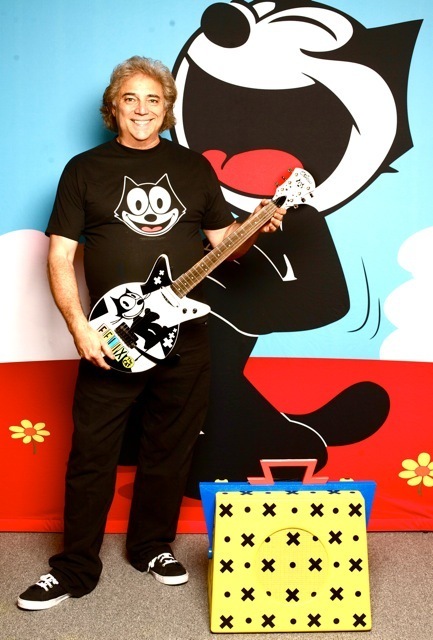 Now, IDW Publishing have collected Don Oriolo’s works together in a new full-color hardcover book, Felix the Cat Paintings. Check it out at Amazon, before it hits the shelves early next year. The book features a forward by comic book historian Craig Yoe, as well as essays from cartoon aficionados like Jerry Beck, Mark Evanier, David Gerstein, and Paul Castiglia.